Walkout first premiered in 2006 on HBO and is directed by Edward James Olmos, considering the current struggles the world is facing today and in commemoration of the landmark event, it was added as part of the films shown for the 25th anniversary of the San Diego Latin Film Festival. Walkout is about the 1968 high school walk out that occurred in East Los Angeles, helping propel education in the Chicano community and the Chicano civil rights movement forward. Honor student Paula Crisostomo (Alex Vega) becomes outraged when she begins to realize after attending a Chicano leadership camp and upon seeing other schools in Los Angeles, that the poor conditions, treatment, and education offered to Chicanos was sub-par to the rest. She gets involved in the activist community and along with her fellow Mexican-American friends, teacher Sal Castro (Michael Pena) and activist leader Moctesuma Esparza (Bodie Olmos), they begin a campaign, and demand changes are made to the educational system for Chicanos. The students form a set of 3 walk outs, which end up attracting the attention of law enforcement and the news. The students are beaten and treated like dogs on the street, but what ends up being shown on national television is nothing of the sort. Instead the event was painted as being peaceful and as if nothing significant happened. Eventually the walk outs gain so much attention, that the leaders of the groups and some of the brown berets, get taken to court and charged with conspiracy to commit a misdemeanor, and if convicted a 60-year jail sentence. The film was provocative and entertaining, and I felt ashamed that I had never heard about this story. It made me realize how much none of this is taught in our schools and how it is hidden from history. It was a wonderful movie to watch and I hope that this film can be shown in schools to inspire all students to stand up for their beliefs. Executive Producer Moctesuma Esparza opened the screening by providing a brief history of the film. He mentioned that over 20 thousand students participated in the walk out and how after the protests there was a huge increase from only 2 students in LA attending college to over 1,000 Mexican-Americas. 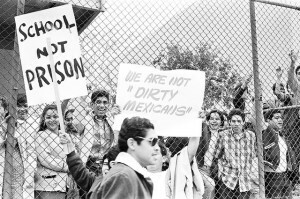 At the time, Chicanos were discouraged to attend college, and instead were told to become mechanics or secretaries, and for those numbers to increase was phenomenal and shows that what they did make a difference to the world. Esparza built much of his career on telling the history of others, from Roosevelt to Gettysburg, but once he was settled as a producer, he was able to finally tell his story. He told audiences that being an activist is a lifetime commitment and said, “a singular moment does not change things, but years of commitment.” In today’s ever-changing political landscape and upheaval, especially against immigrants and Mexicans, his words resonate deeply. The San Diego Latino Film Festival runs from March 15 – 25.